The other day our team got together and discussed the censorship of medical marijuana knowledge. Despite the multitude of studies supporting the medicinal benefits of cannabis, not much is changing and the plant remains illegal. Marijuana has been used since the beginning of recorded history. From it we’ve made a number of things such as paper, fabric, crops, building materials, proteins, rope, fuel and medicine. Not to mention, oils made from the plant are the most medicinally active substances ever found. That is exactly why it is illegal. It all came down to a vicious fight for billion-dollar markets that took place in the early 1900’s. In 1913, Henry Ford opened his famous automobile assembly line to start producing the Model-T. In the 30’s, Ford opened a plant in Michigan where they successfully experimented with biomass fuel conversion, proving that hemp could be used as an alternative to fossil fuels. They extracted methanol, charcoal fuel, tar, pitch ethyl-acetate, and creosote all from hemp. What this meant for Ford was that he could now not only produce their own raw materials to make cars, but he could make the fuel to run them as well. The discovery was horrible news for a man by the name of Andrew Melon, who owned much of the Gulf Oil Corporation; a company who had just recently opened their first drive through gas station. Andrew Mellon was the Secretary of the Treasury under President Herbert Hoover, and owner of the 6th largest bank at the time, Mellon Bank. His bank was the primary financial support of a petrochemical company by the name of DuPont. DuPont was developing and patenting many different forms of synthetics from fossil fuels including the synthetic rubber, plastic, rayon, and paint that GM used to coat their cars. However, Mellon Bank was most heavily invested in DuPont’s sulfur-based process of turning wood fiber into usable paper. 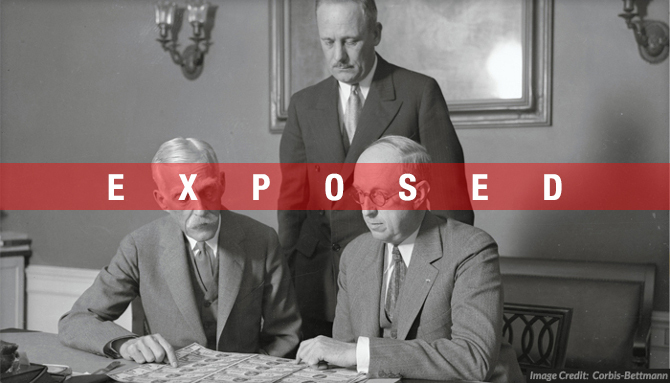 The DuPont Corporation was persistently lobbying in Washington DC, while Hearst began a racist smear campaign in his newspapers. A quote from one of Hearst’s papers, “Marihuana influences Negroes to look at white people in the eye, step on white men’s shadows, and look at a white woman twice.” Hearst’s newspaper was the fuel to the fire for the prohibition of marijuana. He painted cannabis as an extremely dangerous drug in his “Yellow Journalism“, and convinced millions of Americans (many of them congressmen) that the harmless plant is in fact, evil. Films like ‘Reefer Madness‘ had the public blaming cannabis for everything from car accidents to death. The Federal Bureau of Narcotics (FBN) was an agency of the US Department of the Treasury, and was established in 1932 by an act consolidating the functions of the Federal Narcotics Control Board, and the Narcotic Division. Andrew Mellon appointed his niece’s husband, Harry J. Anslinger as the chief of the newly consolidated agency. Anslinger testified before Congress by saying, “Marijuana is the most violence causing drug in the history of mankind…Most marijuana smokers are Negroes, Hispanics, Filipinos and entertainers. Their Satanic music, jazz and swing, result from marijuana usage. This marijuana causes white women to seek sexual relations with Negroes.” He often used propaganda stories run by Hearst’s newspapers while lobbying. Anslinger ordered the Treasury Department’s general consul Herman Oliphant to secretly begin drafting a bill that would slip easily through both Congress and the Court. After two years the FBN proposed the “Marihuana Tax Act of 1937“, which placed a tax on the sale of cannabis. Anslinger disguised the act as a tax revenue bill, and pushed it through the house by introducing it directly to the House Ways & Means Committee. This is the only committee that can introduce a bill to the House floor without it being debated by other committees, and the chairman happened to be an ally of DuPont, Robert Doughton. It was later seen by another DuPont ally, Prentiss Bown in the Senate Finance Committee, where it was stamped into law. That same year, DuPont patented a new fabric called ‘nylon,’ which Andrew Mellon was also heavily invested in. Nevertheless, the act was passed and Samuel Caldwell and Moses Baca were the first official convicted marijuana criminals for dealing and possession not long after. Baca got off easy with 18 months, compared to Caldwell who was sentenced to 4 years of hard labor in Leavenworth Penitentiary. While the act itself did not criminalize the possession or use of cannabis, it did include penalties of up to $2,000 (equivalent to about $30,000 today), and 5 years in jail for violators. Later in 1967, President Johnson commented on the Marihuana Tax act of 1937, “The act raises an insignificant amount of revenue and exposes an insignificant number of marijuana transactions to public view since only a handful of people are registered under the act. It has become, in effect, solely a criminal law, imposing sanctions upon people who sell, acquire, or possess marijuana.” Subsequently, part of the act was ruled unconstitutional in the 1969 case, Leary v. United States, because it violated our 5th amendment by forcing a person to incriminate one’s self to obtain a tax stamp. Congress was not happy about this ruling, and as a result passed the Controlled Substances Act as Title II of the Comprehensive Drug Abuse Prevention and Control Act of 1970. Now, let’s ask ourselves something. Why would the pharmaceutical industry, the same companies who in the early 1900’s produced hemp medicine for decades, make a claim like that? As we all know, you cannot patent a plant or the naturally occurring compounds in the plant. For this reason, there was no interest by the major pharmaceutical companies to support further research or development of the plant – there was simply no money in it for them. As a matter of fact, legalization would actually be detrimental to their business, similar to the situation facing the paper and fabric industries. When you consider all of these facts, it is apparent why the ‘drug’ is classified like it is and why it remains federally illegal. Pharmaceuticals are big business, and legalizing cannabis would mean losing hundreds of billions of dollars to a single, naturally occurring plant that anyone could grow in their backyard. The same goes for the hundreds of businesses in the paper and fabric industries that would lose profits to hemp substitutes. It is all about money and keeping the system chugging. That is why stories of an 8-month old child being cured of brain cancer from cannabis oil will never make headline news. The only thing we can do is work together as a community to spread these stories ourselves. In an age where we are more connected than ever before, it is up to us to control the national discussion, and take the power out of the hands of large corporations and biased media. Word of mouth is the most powerful tool we possess to fight this uphill battle against marijuana prohibition. Now is the time to take a stance and voice your opinion.